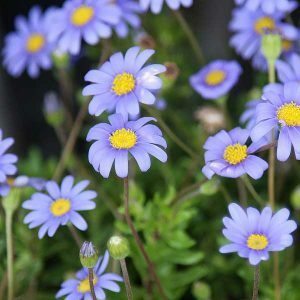 Long flowering, well suited to growing pots and containers, easy care and with very attractive blue flowers, the Blue Marguerite Daisy is Felicia amelloides. This attractive plant also makes a great addition to the cottage garden, in fact any reasonably sunny position in a well drained soil. This species is from South Africa and has been in cultivation since the mid 1800s. In our conditions this pretty daisy will flower through the year with spring and autumn being the most productive time. The plant will reach around 60 cm in height, the foliage is a good green, however it is the blue flowers with their golden yellow centres that are the real attraction. You can grow the Blue Marguerite from seeds, or from seedlings, usually available for sale in spring. Once established this is a remarkably hardy little plant. Best pruned back after flowering to promote a bushy habit, you can also strike some cuttings at this time. Grow it is with spring flowering bulbs for a great effect. For long flowering, choose a position where the plant will be protected from the heat of the afternoon sun in summer. Soil must be well drained, and a dryish climate is best. Raise the garden bed a little if needed. Avoid positions where humidity will be high as this causes fungal problems. Watering – Keep slightly moist over summer, however do not over water as this can cause fungal problems. Pruning – Best pruned hard in autumn, dead heading after flowering is also recommended. Pruning after flowering prevents the plant from becoming leggy, and sparse in growth habit. Easy from cuttings, in fact Blue Marguerite will self layer itself in good soil conditions. Also possible from seed.